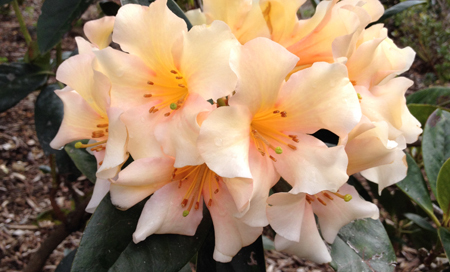 Again this year we’ve been favoured with a generous body of contributions to The Rhododendron, covering a variety of interesting topics. Articles on practical aspects of propagating and caring for plants are always a welcome component, and a number of these appear in this volume. Alongside Neil Jordan’s discussion of using plastic boxes as convenient mini-glasshouses for propagation, it seemed appropriate to ask American Rhododendron Society member Joe Bruso for permission to republish his recent article on successful propagation using desiccated cutting material, and hopefully both will prove useful to readers keen on propagating plants, along with Lyn Craven’s note on the value of Condy’s Crystals to inhibit fungal attack. Similarly, Sylvia Saperstein’s discussion of a range of fungal and disease problems affecting vireyas and recommended remedies should be appreciated. And I’ve only highlighted some of the practically-oriented content, and leave it to the reader to discover the rest. And, as always, there’s a wealth of news and interesting discussion of particular rhododendrons, their amazing diversity and rhododendron habitats.